I recently had a coconut milk ice cream and I’ll be darned if I can remember where, but I really liked it and fortunately the idea stayed with me. Use half and half for a slightly lighter version, it reminds me of ice milk in texture. Chop any kind of nuts to garnish the ice cream for crunch; pop them in a bag and gently crush with a meat mallet or the bottom of a heavy-bottomed pan. I chose candy-coated almonds for a little color as well as crunch; other options include chocolate-covered almonds or spiced nuts. Tip: Set your freezer temperature to 4ºF for ice cream that is easy to scoop. 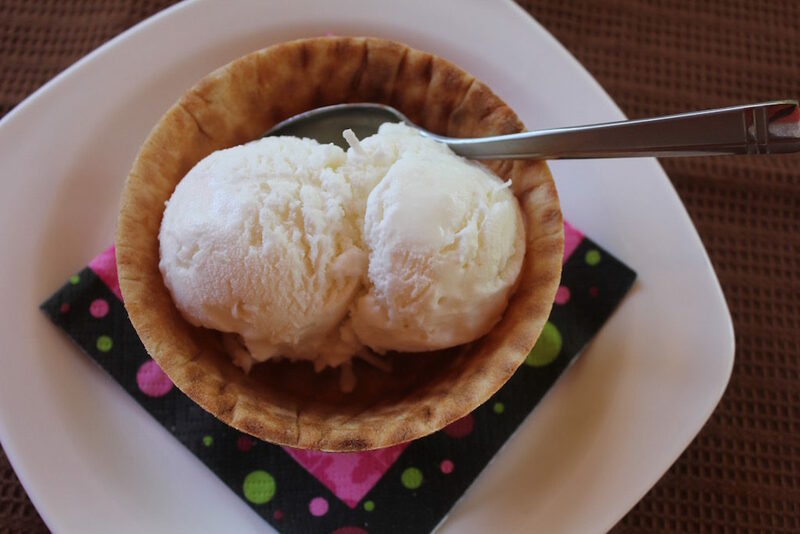 Jazz up this coconut milk ice cream with some crushed nuts for color and crunch. Whisk together the half and half, coconut milk, sugar, coconut extract and salt in a medium-size bowl until sugar is dissolved, about three minutes. Chill for at least one hour. Follow the instructions for your ice cream maker. About halfway through the churning, add the coconut flakes and continue churning as directed. Use the half and half for a slightly lighter version, it reminds me of ice milk in texture. Ice cream is one of America’s favorite treats and strawberry ice cream is a classic. To celebrate the publication of my cookbook, Endless Summer: 54 quick and creative ice cream and dessert recipes, I’m publishing my recipe for strawberry ice cream. Here’s the story behind Endless Summer. The Monday before Christmas (2013) I got a call from my client at Zoku LLC. They had a new product, individual ice cream makers, and wanted to know if I’d like to write an ice cream book to accompany this new venture. Having worked with them before, I knew they operate on a tight deadline and this one was particularly challenging. Write the book in six weeks! Endless Summer is available at Williams-Sonoma stores and online, as well as amazon.com and other venues. 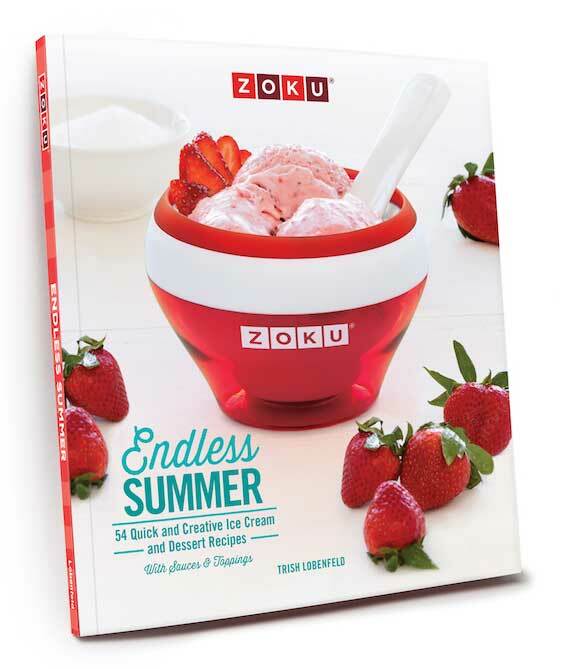 The book is sold separately from the Zoku Ice Cream Maker and works for traditional ice cream machines. There are 54 recipes for ice cream, gelato, sorbet, granita and some dairy-free frozen desserts as well as recipes for sauces, apple pie, profiteroles, ice cream cones and more. I am particularly pleased with, well all of them, but a couple of favorites are the Pumpkin Pie, White Chocolate & Fudge Swirl, and Coconut Milk, Lemongrass, Ginger & Jalapeño (one of the dairy-free desserts). 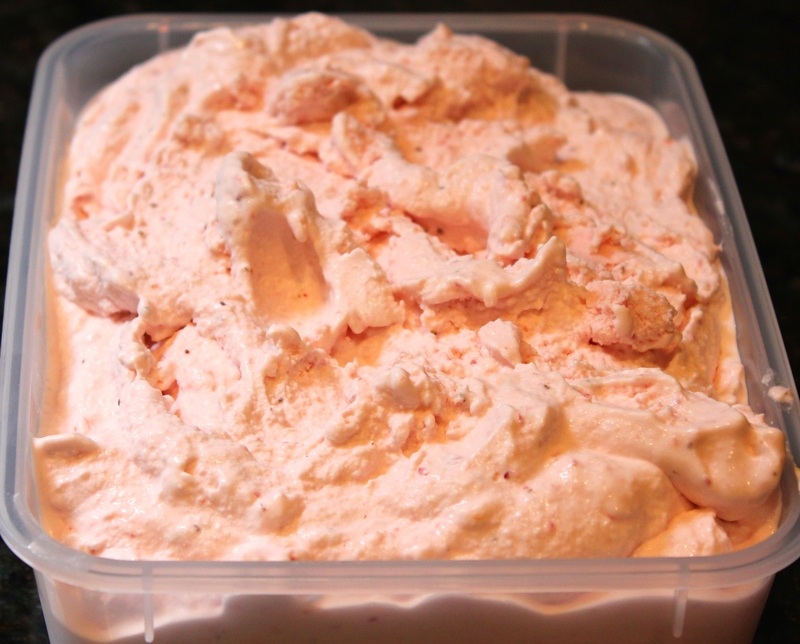 With Zoku’s permission, here is the recipe for strawberry ice cream. Check out Zoku’s website to see all their fun individual appliances, such as the Quick Pop Maker and the Slush and Shake Maker. Great recipe books for these, too! 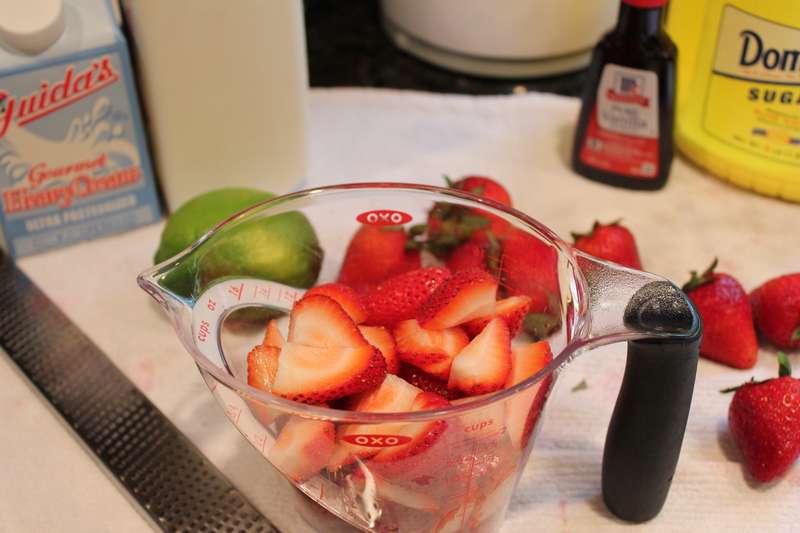 Puree the strawberries, sugar, lime juice, vanilla and salt in a blender or food processor. Add the cream and milk and pulse to combine. Chill ice cream mixture and stir well before using. Follow the instructions included with your ice cream maker for churning and freezing. 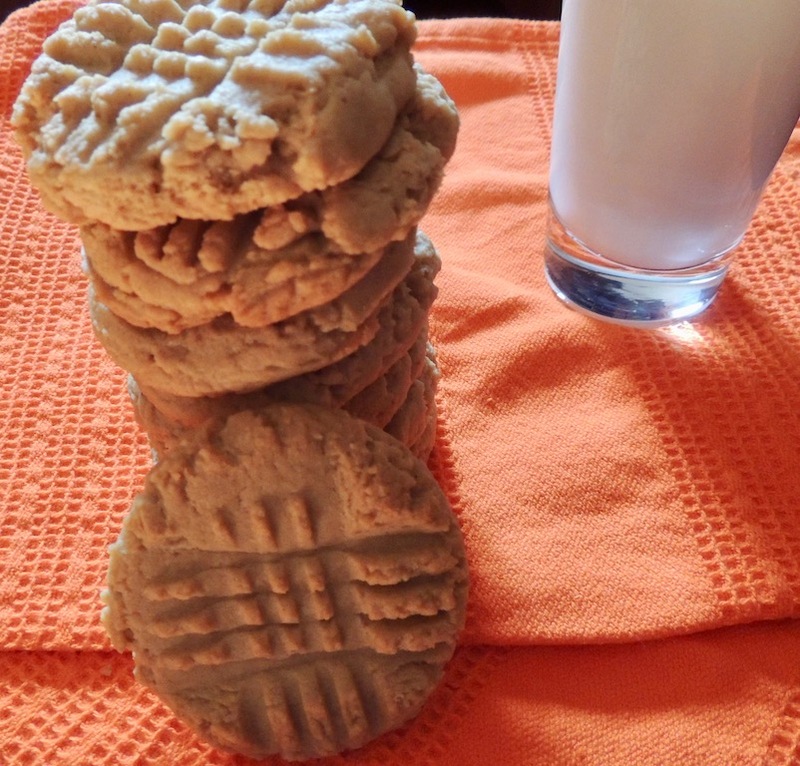 Get our recipe for peanut butter cookies and make PB&J ice cream sandwiches! Tip: To maximize the strawberry flavor, cut large strawberries in quarters and small one in half to get a full measure. 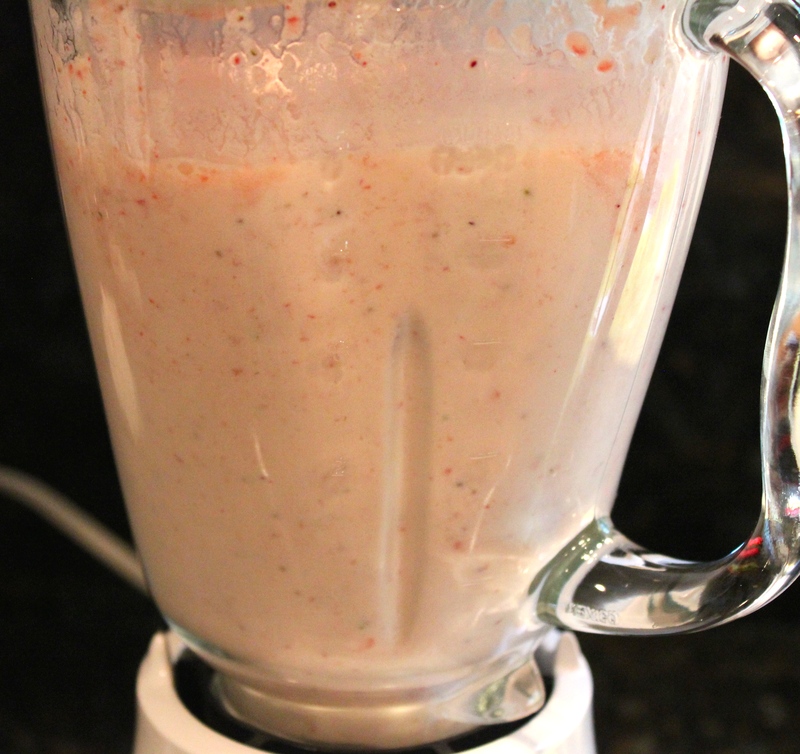 Puree the strawberries, sugar, lime juice, vanilla and salt in a blender or food processor. Add the cream and milk and pulse to combine. Transfer to a storage container and refrigerate for at least five hours or overnight. Stir well before using. To make the PB&J ice cream sandwiches, take one cookie and place 4 ounces/1/4 cup ice cream on the backside of the cookie and cover with another cookie and gently press. Trish's latest book is out! ULTIMATE BISCOTTI is now available on Amazon! Scrambled Eggs follows a father and son in their escapade to visit a chicken farm and learn about where eggs come from and how chickens live. Buy the book. Fifty-four recipes for frozen treats any season of the year. Buy the book. MISSON STATEMENT: To share my love of food and to educate how to cook from scratch. The overall goal is to help home cooks improve their skills in reading and understanding recipes, in measuring ingredients, properly using cooking techniques, and in assessing the sensory characteristics of fresh ingredients and prepared food. It is my wish to make everyone a more confident cook and to enjoy being in your kitchen entertaining your friends and family. Honeypie’s Recipes is a proud and active supporter of Friends of Karen! © 2019 Honeypie's Recipes. All rights reserved. Please contact me for permission to use content.